In the most recent copy of Preservation magazine, a publication of the National Trust for Historic Preservation, is a good article on the National Register of Historic Places. Step One: Anyone can nominate a place to be registered. To do so, one fills out a form (located here) and submits it to the State Historic Preservation Office (SHPO). In Missouri, the SHPO is located within the Department of Natural Resources (DNR). Also, through the law which created the SHPO in Missouri, the nominations are reviewed by the Missouri Advisory Council on Historic Preservation – a council of individuals appointed by the governor that meets four times a year. Step Two: The SHPO reviews the nomination. In that process, if it believes the nomination worthy, it will contact the owners of the landmarks, places, or buildings to inform them of the nomination. If the owner objects, then the nomination is ended. No owner (or majority of owners in a situation where multiples properties are involved) can be forced to have their property placed on the Register. However, benefits can be had if one’s property is registered! First, being on the register opens up the property to receive grants or funding, some that are exclusive to registered properties. Second, the property then can become eligible for tax credits to fund restorations or renovations. Third, the owners get to receive the honor of having their property recognized as something of special importance to our nation’s and or the community’s history. If the property appears to meet the above criteria, then it has a good chance of being accepted. However, a property usually needs to be at least 50 years old. Another aspect of a property being on the Register is that it does not restrict the owner from doing anything with their property (including tearing it down – as the Connor and other Joplin properties that made the register ended up suffering). The only restrictions are those which local or state laws or regulations might place on such historic properties. 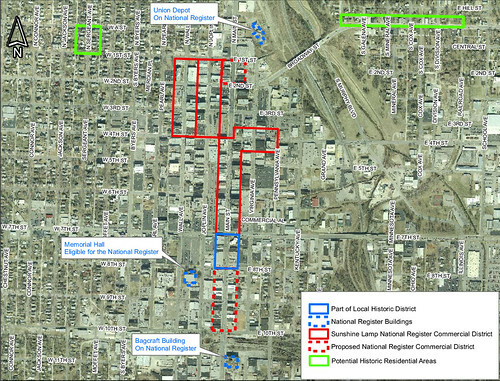 Joplin is home to more than a few registered places and landmarks, most recently the Historic Districts located along Main Street and such buildings as the Olivia, Carnegie Library, and the Union Depot. For more buildings and places, just check out this link. The forms are wonderful sources for the history of a place, building, or landmark, as well photographs or illustrations. Sources: Missouri Department of Natural Resources, Preservation magazine. Last month, one of the historic barns of the Joplin area, a round barn located just south of the city near Saginaw, was severely damaged in a spring blizzard. We covered the article on the barn then, and now bring to you a new development. At the time, the owners of the barn had believed the structure had been fatally structured and all that remained in its future was a bulldozer. Since then, the owners have been in contact with the State Historic Preservation Office about it nominating the barn for the National Register of Historic Places. If this were to happen, the owners would eligible for tax credits which could be put toward restoring the barn. Granted, being listed on the National Register is not a magic cure all. Joplin’s most impressive and perhaps, most fabulous building, the Connor Hotel was also on the National Register, after all. For now, we can only hope for the best. See this link for the Globe article on recent developments, as well an antique picture of the barn. This page took 0.350 seconds of computer labor to produce.